Alem, Yonas. 2018. “Shocks, Remittances and Household Consumption.” EfD Discussion Paper Series 18-02. This study uses a dynamic system GMM regression on five rounds of panel data to estimate the impact of international remittances on consumption of urban Ethiopian households, who spend more than 70% of their consumption budget on food. Results suggest that international remittances play a significant role in augmenting household consumption. A 1% increase in remittances from abroad leads to a 0.10% increase in household consumption. 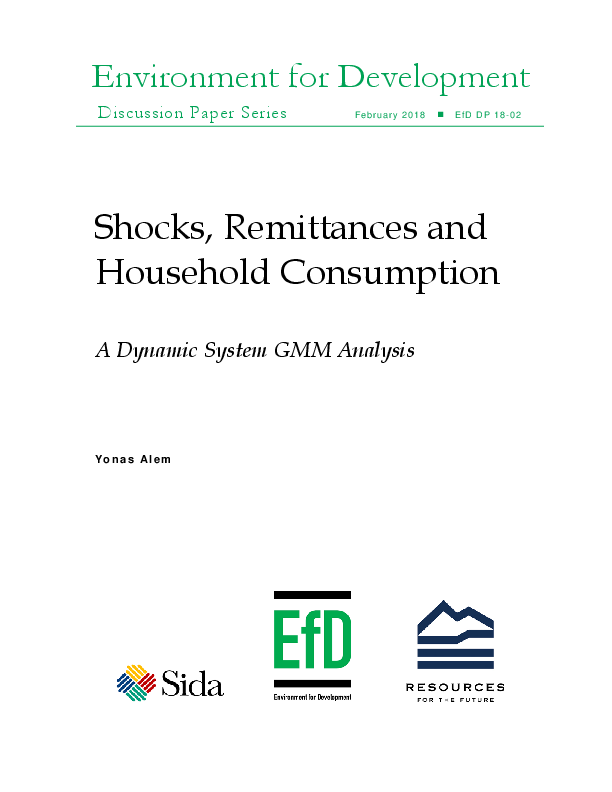 Taking advantage of the detailed nature of the panel data, the study also show that households that experienced idiosyncratic shocks are likely to send a member abroad and receive international remittances. The paper sheds light on the magnitude of the impact of international remittances and the characteristics of the socio-economic groups who take advantage of a rapidly changing economic environment, such as access to international migration.